Addiction on psychostimulants like any other drug addiction is a complex medical and social problem involving biological changes in the brain as well as numerous social, familial, and environmental aspects. Therefore, psychostimulants addiction treatment is also must be complex and address a variety of problems. To be effective psychostimulant treatment strategies must include pharmacological, psychological and social aspects of the patient's drug abuse. No one form of psychostimulants addiction treatment is right for every drug addict. It is important to match the treatment to the preferences, beliefs and needs of the individual. Psychostimulant addiction is a common problem as psychostimulants have very similar chemical structures as Cocaine, ecstasy (MDMA), amphetamines and Crystal Meth. Some commonly used treatment approaches for psychostimulant addiction at our clinic are listed below. Psychostimulant addiction leads to physical, psychiatric and psychosocial deterioration. Unfortunately, no medication is yet available to help psychostimulant addicts manage the lasting cravings that threaten sobriety. On a neuromediator level, stimulant drugs increase dopamine, noradrenalin and interact with monoamine transporters in the brain. The increased level of dopamine is a main contributing mechanism of addiction on psycostimulants. The new pharmacological approach in psychostimulants addiction tretament (especially, cocaine addiction) is a medication which reliably bocks dophamine receptors in the central nervous system and thus effectively reduces abstinence symptoms and craving for psychostimulants. In literature, the compound is known under name LEK-8829. Other pathogenetic medications include: Baclofen, a derivative of gamma-aminobutyric acid (GABA) , and Bromocriptinum, a dopamine blocker, which also reduce craving for psychostimulants. 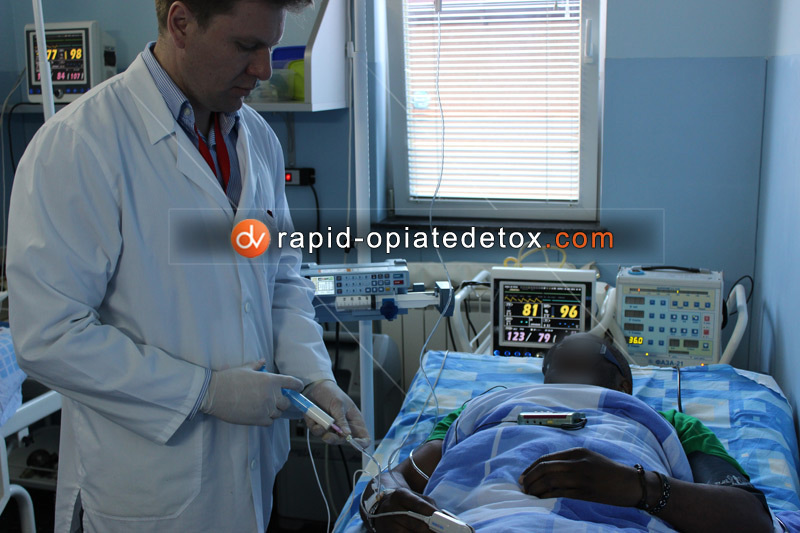 Any successful drug addiction treatment starts with drug detoxification. Treatment for psychostimulant addiction is no exception. Less common psychostimulants withdrawal symptoms include severe depression, hallucinations, suicidal thoughts and even suicide attempts. Usually these withdrawal symptoms are only seen in people who have been taking very high doses and discontinue the drug without special treatment. To treat symptoms of withdrawal we use medications from different pharmacological groups: sedatives, hypnotics, anxiolytics, tranquilizers, antidepressants and their combinations. At our clinic we employ three key medical procedures to treat psychological dependence on psychostimulants. They are Central Cholinolythic Blockade, Neuro Jet Therapy (N.E.T. therapy) and Ibogaine treatment. During the procedure the patient is put under medical sleep for four-five hours. Central cholinolytic blockade destroys pathological inter-neuron drug associations in addict's brain and effectively creates the new behavioral patterns. Symptoms of withdrawal and urge for psychostimulants can be partially explained by the deficit of dopamine and natural endorphins in the central nervous system of an addict as a result of their excessive use during the euphoric phase. The lack of neuromediators can be successfully restored through electrical stimulation of the specific brain zones. This technique is successfully implemented with the help of computer-controlled neurostimulation. The process is exercised though the electrodes (similar to ECG electrodes) glued to the skin in under-ear areas. Electrical signals of selected frequency and amplitude induce production of natural neurotransmitters, compensating by this the lack of dopamine and endorphins in patient's brain, that clinically results in elimination of withdrawal syndrome and craving for drugs. Ibogaine is a herbal alkaloid. Taken orally it puts a patient into a state of medical hypnosis for a few hours, during which his impaired brain is undergoing the psychological purge. After Ibogaine treatment the people loose their former interest to drugs. They can't understand why they were so much attracted to them for so many years. Ibogaine treatment miraculously cures people who have already lost any hope to be cured by other methods. Researchers are also investigating a vaccine against psychostimulants, that once administered, would prevent the drugs from having any rewarding effects. CBT is one of the most effective psychological interventions for psychostimulant addiction, that helps the addicts create and then enforce their motivation to quit the addiction and provides them with techniques to avoid relapse. This approach helps patients to recognize, avoid, and cope with the situations in which they are most likely to use drugs. Through this method our patients learn skills how to cope with craving for drugs, to overcome negative life events, to build up the new relationships and to obtain social support. CBT is congruent with other forms of psychostimulant addiction treatment and works very well when it is combined with such components as 12 step program, individual therapy, support group attendance, family therapy, education and behavioral interventions. To treat addiction on stimulants is a hard task and a long process. The longer a person stays active in treatment, the better the chances of long term recovery. People who stay active in treatment for 1 year and longer demonstrate much better results over the long run.